The West Springfield JV baseball team being presented with military-inspired cleats from Hope For The Warriors and its community donors. For more photos visit, https://bit.ly/2y7fQTR. 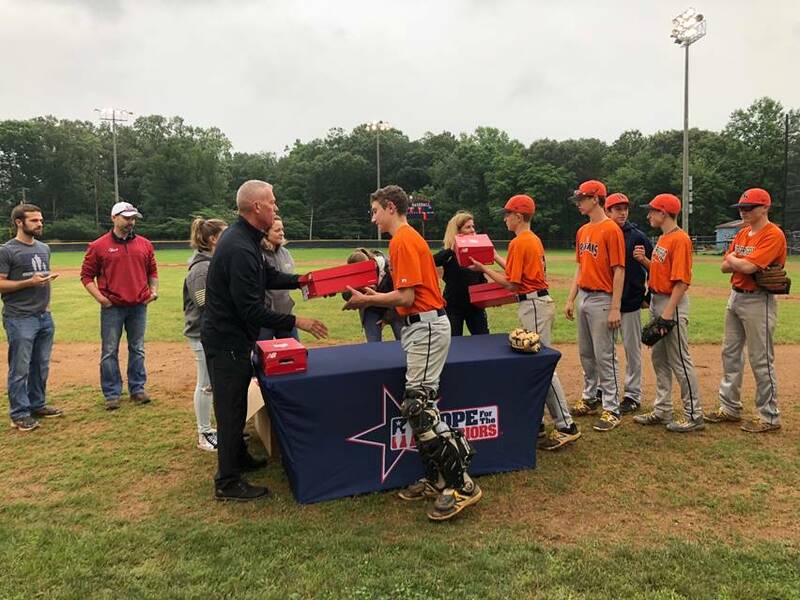 WEST SPRINGFIELD, Va. (June 13, 2018) – On Monday, Hope For The Warriors hosted an intra-squad baseball game at West Springfield High School in memory of U.S. Army Major Paul Voelke, whose 14 year-old son AJ, is a member of the team. Out of the 23 players on the roster, 10 are military children and three of the five coaches served in the U.S. military. Prior to the start of the game, Hope For The Warriors, surprised the entire team by presenting them with military-inspired New Balance cleats. In addition, Marine veteran and Hope For The Warriors COO Chris Sharon shared a message of respect and encouragement, while recognizing the sacrifices made by military families and thanking the community for its support. Celebrating 11 years of service, Hope For The Warriors is a national nonprofit that assists veterans, service members and military families with a variety of programming including clinical health and wellness and sports and recreation. As an added surprise, the Voelke family received autographed cleats from Red Sox second baseman Dustin Pedroia. In addition to honoring Major Paul Voelke and military kids everywhere, the game was hosted in conjunction with New Balance’s cleat campaign benefiting Hope For The Warriors. Now through July 4, New Balance will donate 10 percent of the proceeds of each NB1 3000v3 Cleat with Camo Plate sold on newbalance.com. For more photos visit, https://bit.ly/2y7fQTR.